Our daughter has been home from school for two days with a cold, coughing, fever, etc. I had planned to make Applebee’s Oriental Chicken Salad for supper tonight, but thought a chicken soup would be better for a sick girl. 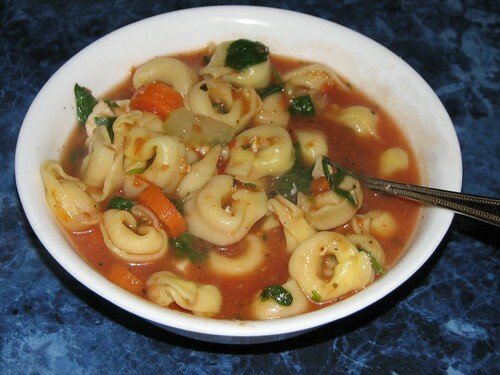 After looking at a few chicken and tortellini recipes, I came up with my own version. 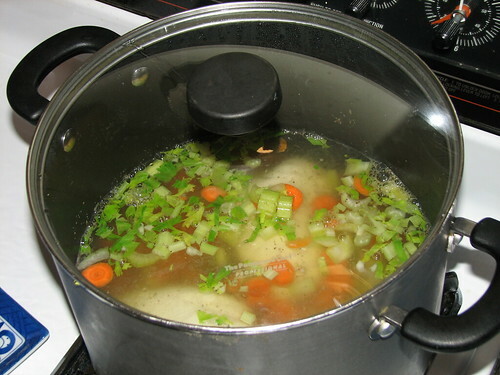 Put the chicken, celery, carrots, onion, celery seed, basil, thyme and garlic in the stock pot of cold water and bring to a boil. Reduce to a bare simmer, cover, and cook the chicken for 15 minutes. Check internal temperature. Chicken is done when the internal temperature reaches 165*. If you don’t have an instant read thermometer, the chicken is done when the juices run clear. 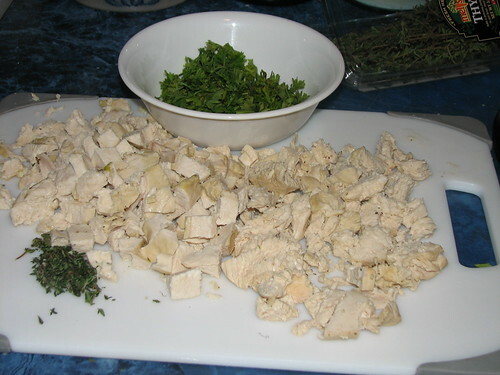 Cutting into the thickest part of the chicken should show white meat, with no pink. Add the chicken stock to the water and veggies. Bring to rolling boil and add the pasta. Cook for about half the time recommended. Remove from heat. The pasta will continue to cook in the hot liquid. Dice the chicken and return it to the pot. Add the parsley, spinach and crushed tomatoes. Salt and pepper to taste. Stir well. Serve hot with crusty bread. Sprinkle a little grated Parmesan on top each bowl, if desired. A crisp Romaine salad would be good with it. 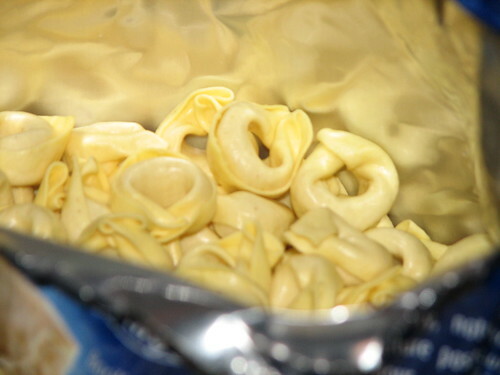 After the soup sits, the pasta will soak up a lot of the moisture. If you want your soup with more liquid, add more. Water, broth, or tomato juice/sauce would work fine. 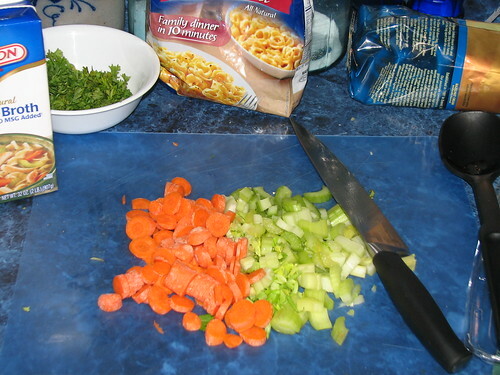 This entry was written by ~~Rhonda, posted on January 22, 2010 at 6:39 pm, filed under cooking, Recipes and tagged chicken tortellini soup, recipe, soup. Bookmark the permalink. Follow any comments here with the RSS feed for this post. Post a comment or leave a trackback: Trackback URL. My daughter gave us the leftovers from her making a batch of this soup. It was delicious. I had to get the recipe from her to make us a pot again. I love this soup. It has become a staple in my dinner menu. My kids love it! I have made it for pot luck dinners and had people rave about it.. Thank you!